The Mason Fayette Lodge No. 107 F.&A.M. in Washington Court House elected new officers for 2019. Pictured (L to R): Matthew Rumer, Terry Gruber, Leonard Sines, Justin Coffman, Brent Garringer, Paul Sands, John Coffman, Ken Arnold, Anthony Cooper, Charles Cruther and Charles Zinn. 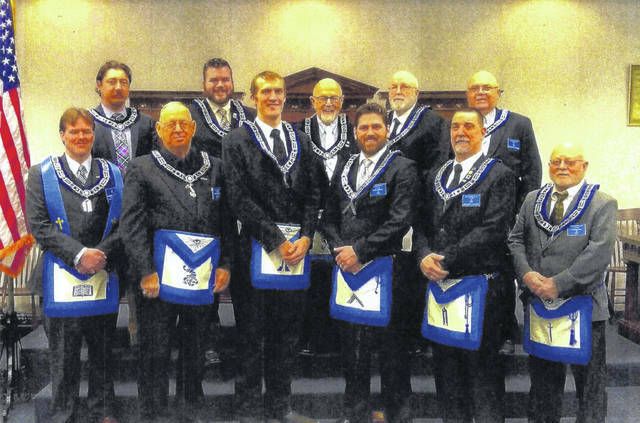 https://www.recordherald.com/wp-content/uploads/sites/27/2019/04/web1_img010.jpgThe Mason Fayette Lodge No. 107 F.&A.M. in Washington Court House elected new officers for 2019. Pictured (L to R): Matthew Rumer, Terry Gruber, Leonard Sines, Justin Coffman, Brent Garringer, Paul Sands, John Coffman, Ken Arnold, Anthony Cooper, Charles Cruther and Charles Zinn.